The new calves being born this spring are fantastic. Looking forward to a nice selection sired by Cowboy Cut, WC United, Unomas, NLC Upgrade, Angus(Gar Profit and Sandpoint Butkus), Combustible Son, just to name a few. 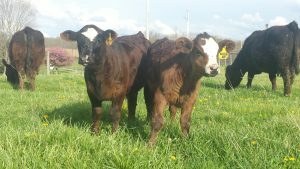 Stop by and have a look- you may just find that next herd bull or show heifer. I have a couple of May 2016 bulls in the lot For Sale. #3117143 DSC Overhaulin (Solid Black) and #3117142 DSC Pale Face (Blaze Face). Both of these young sires will be perfect for a July 2017 or after turn out. Below is DSC Pale Face (left) along with our 20 month old Combustible son (right). Call Dan for more info on these 2 sires Overloadin and Pale Face. 740-877-7060. Below is DSC Combustible at 9 months. 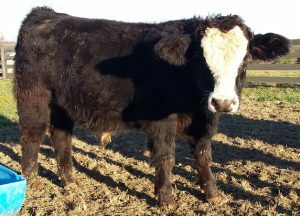 Calves arriving Feb 2017 from this young sire. This entry was posted in Bulls, Sales. Bookmark the permalink.